Guidance for using Lenovo OneKey Recovery to restore operating system to factory default settings from initial backup. For Lenovo products, desktops (IdeaCenter, Lenovo series desktop, ThinkCenter), notebooks & tablets (IdeaPad, lenovo series notebook & tablets, ThinkPad) and workstations, most of them are embedded with a system backup and restore tool – Lenovo OneKey Recovery. In general, together with Lenovo OneKey Recovery, there is a hidden system recovery partition created when published by manufacturer. This partition contains an image of os created by Lenovo OneKey Recovery initial backup. When something unpleasant and unexpected happens, for example, system crash due to virus/hijack attack, software error or wrong operation, Lenovo users can restore from initial backup with Lenovo OneKey Recovery. Just as mentioned above, when accidents happen, you can use Lenovo OneKey Recovery factory default (default recovery partition and default recovery method-restore from initial backup) to restore Lenovo to factory defaults. Here, take the latest Lenovo OneKey Recovery 8.0 for example. If the machine is on, just double-click its icon or follow "Start"->"All apps" -> "Lenovo" -> "Lenovo OneKey Recovery" to launch it. 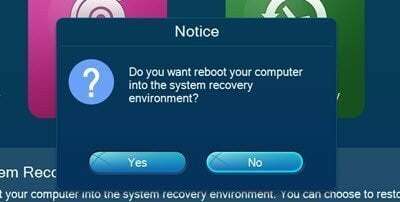 Then, choose “System Recovery” to reboot into system recovery environment. If the machine is off, you can directly press Novo Button, usually on the upper left of the top near power button, to first enter Novo Button Menu. Then, select “System Recovery” to enter recovery environment. Step2. In the restoration environment, keep the default choice “Restore from initial backup” and continue. 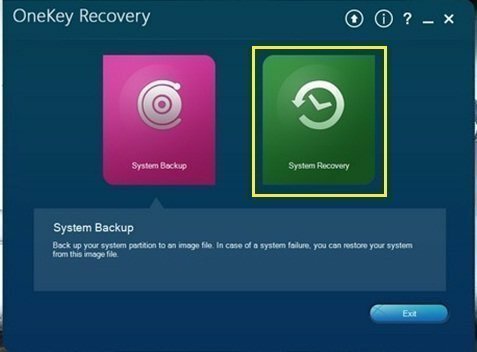 The other choice “Restore from user’s backup” will help you recover your system back to a former healthy state from where you created the backup image. This image file is not the factory image saved in default recovery partition, but an image of system created by you after you start using the machine. After restoration, all the data on current C Partition will be erased. Therefore, if there are import data on it, please transfer them to another place or make a backup of those files. Step3.Confirm the recovery and start restoration. Since the operating system does not work, the machine is of course off. So, you can only open Lenovo OneKey Recovery by pressing Novo Button. Then follow the steps like laid above. AOMEI OneKey Recovery is an alternative to Lenovo OneKey Recovery. Similar to the latter, you should first have a recovery partition before starting initial backup restore. 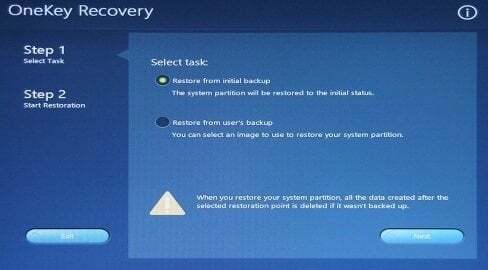 Something different is that you should make an os recovery partition by yourself. There is no recovery partition in default for AOMEI OneKey Recovery is not Lenovo built-in tool. It is a third party program. Step1. Open AOMEI OneKey Recovery. Double-click its icon or follow "Start"->"All apps"->"AOMEI OneKey Recovery" to launch it. Step2.In its main interface, click “OneKey System Recovery”. Step3. Keep default “Restore system by using the image file in AOMEI OneKey Recovery Partition”. Tip:The other choice “Restore system by selecting a system image file” can restore your os through other system images stored in other locations. Step4. In default, the current os location will be chosen as the recovery destination. Just let it as it is. Similarly, the destination will be overwritten. So, move out or backup important data on it. You can also restore factory settings to other location by ticking the box on lower left corner. Step5. Make sure everything in control and “Start Restore”. Open AOMEI OneKey Recovery. Power on the machine and continuously press “F11” or “A” （according to your settings when you make the system image）until it enter AOMEI recovery environment. Then, act like steps above to finish the task. When Lenovo OneKey Recovery not working, you can rely on AOMEI OneKey Recovery to do Lenovo OneKey Recovery restore from initial backup. Besides, AOMEI OKR can be applied to other brand machines while Lenovo OKR cannot. Notes: You CAN’T restore system using AOMEI OneKey Recovery through the recovery partition created by Lenovo OneKey Recovery. Generally, different recovery partition is for different recovery tool.